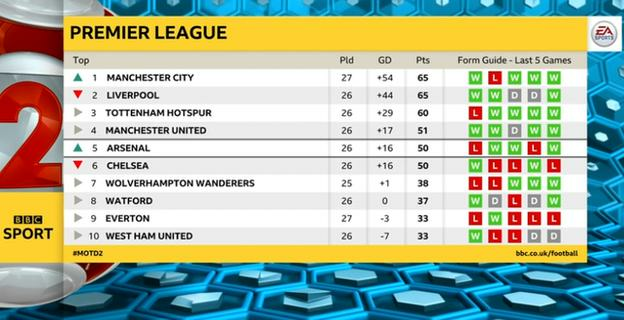 It is a little disrespectful that not many people are talking about Tottenham as potential Premier League winners, because they are in the title race - and they have shown they are not going away. It was typical really that, on a day where Manchester City were sensational and made the headlines with the way they demolished Chelsea to go back above Liverpool at the top of the table, Spurs ground out another unspectacular victory. 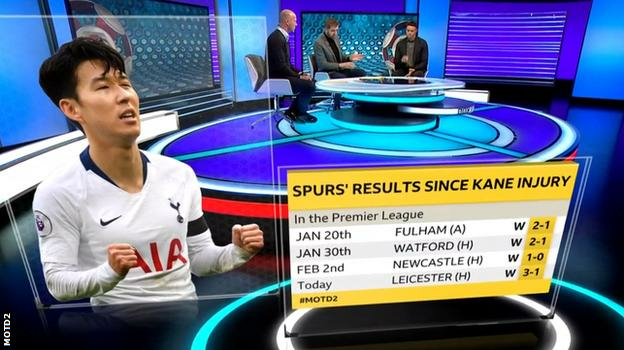 Mauricio Pochettino's side have done something similar in each of their past four league games, but it is actually very impressive that they keep getting results when none of those performances have been particularly great. I thought Leicester were the better team at Wembley on Sunday and the Foxes created chance after chance by getting behind Tottenham's full-backs, Kieran Trippier and Danny Rose, who stayed so high up the pitch. If that happens again in Wednesday's Champions League tie against Borussia Dortmund, Spurs are going to be in trouble because I think they will get punished. But, on this occasion, they not only survived, they found a way to win. It was obviously not the same sort of statement of intent that City made a couple of hours later, but to score three goals and take the three points without playing well at all is still a very good sign of the sort of shape that Spurs are in. Yes, in an ideal world Tottenham would be doing what City did on Sunday, and tearing teams apart, but they are at a stage of their season when their squad is stretched and getting results is the only thing that matters. We know they can play much better than they have done recently, but the fact they are still winning at all with two of their best players in Harry Kane and Dele Alli injured, shows the character of Pochettino and his team. City and Liverpool might be playing the better football but Spurs have got a great attitude, which is more evidence of how good their manager is. Pochettino does not have the same resources or squad depth as his title rivals, and he also has to contend with the debacle over the club's delayed move to their new stadium that has left them playing at a half-empty Wembley every week because of security issues. That has affected the atmosphere further, when some of their fans are getting fed up with travelling there anyway. When you put all of that into the mix, then look at how Spurs have kept on picking up points in recent weeks, it underlines what a magnificent job Pochettino is doing. When Tottenham lost to Wolves at Wembley at the end of December, in what was their fifth league defeat of the season, I saw that as the end of their title hopes. I thought, you cannot lose that many games and still end up as champions. But their form since then has put them back in the hunt. Ultimately, I still don't think Spurs will come out on top, but with three months of the season to go, they definitely still have a chance and you cannot discount them. Who will win it? Well, I picked City at the start of the season, so I am going to stick with them. I am not one to keep on changing my mind like a few people have. But this is a three-horse race and it is going to be an exciting battle for the neutrals as well as for the fans of each of the teams involved. City, Liverpool and Spurs all won this weekend, and it won't be the last time that happens this season. But the last couple of weeks have taught us there are plenty more twists and turns to come. Liverpool and City will not win all of their remaining games and, despite their recent resilience, neither will Spurs. So it is all to play for all three teams. People are already talking about how Liverpool have been feeling the pressure when they dropped points against Leicester and West Ham, but in my experience you don't feel it now - it is April when it really cranks up. A slip-up now is not the end of the world, but if anything goes wrong then, it will be. In the final few weeks of the season, one mistake can cost you everything and the players, managers and fans of the teams involved will all know that. The next three months are going to be intense every time one of the contenders is in action and I am looking forward to seeing how things unfold. Alan Shearer was speaking to BBC Sport's Chris Bevan.